Both Apple’s iBeacon and Bluetooth Low Energy (BLE) devices in general have become popular in the retail market during this past year, but that’s only setting the stage for this new location-detecting technology’s growth over the next five years, according to ABI Research. The London-based emerging technology research firm says we’ll be surrounded by more than 60 million iBeacon-type devices by the year 2019. As other verticals catch on to the functionality offered by knowing when a user is within a few meters of a specific place, the volume of devices being sold and deployed will increase exponentially. Retail might be first to the trend, but it’s verticals like the smart home industry and personal asset tracking that will really make it big. Apple released its iBeacon functionality with iOS 7 but gave few details at the time about working with the technology protocol, which serves as its platform for handling interactions with BLE devices. But before its Worldwide Developer Conference this year, Apple was more forthcoming with advice to developers interested in iBeacon. A “Get Started” guide released at the beginning of June details the capability of iBeacon to ascertain a user’s location, what permissions must be attained to enable that function, and barriers to accuracy. 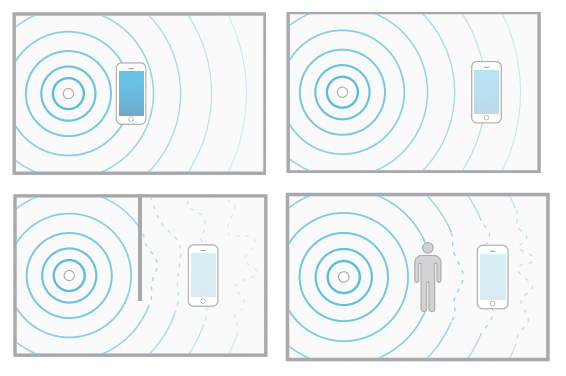 Apple explains iBeacon accuracy: the closer the better, and the fewer objects in the path the better. While Apple didn’t invent the BLE format and its technology isn’t required to execute on location-based capabilities, the firm’s power to quickly make something a popular standard in North America will help a lot. With an iPhone in hand, a consumer is much more likely to make use of those apps that push iBeacon ads, or gives them the ability to turn on their coffee maker from their smartphone. As BLE hardware becomes more popular, ABI Research points out the money to be made isn’t going to come at providing the device layer. The sensors are already low cost and have been commoditized by firms like StickNFind, which offers BLE sensors in the form of stickers you just slap on to whatever you like. While the BLE beacon markets will be $500 million by 2019, there will be no margin on selling the hardware. Instead, it’ll be the services layered on top of the beacons that offer value to consumers and businesses that stand to profit.